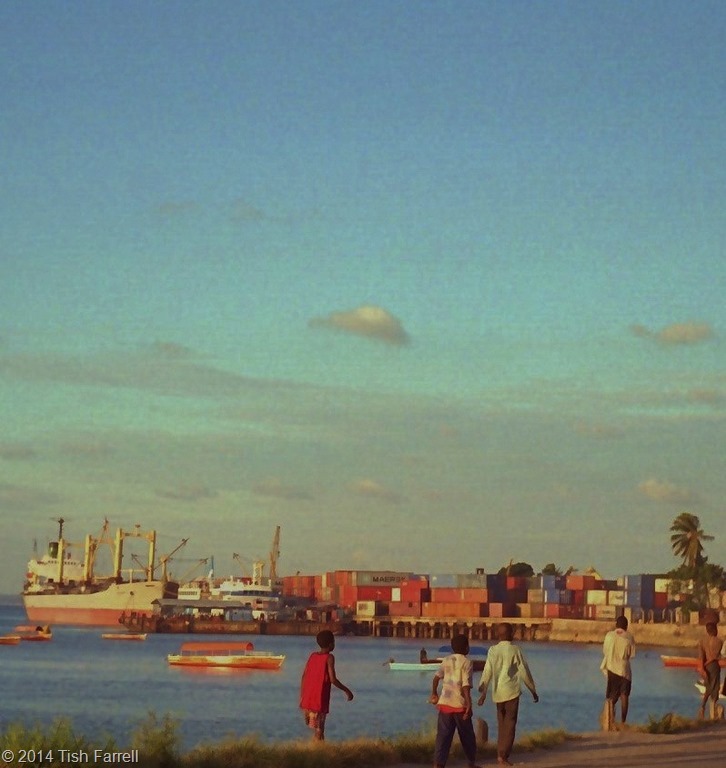 In fact the trade along East Africa had been going on from well before the 9th century. 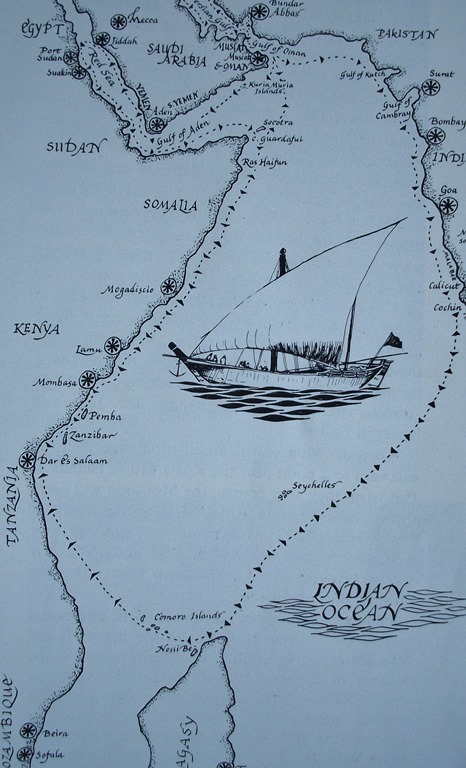 The Periplus of the Erythraean Sea, a Greek account of Indian Ocean trade written around 60 CE, indicates that the people of the kingdoms of Yemen and Arabia already had well established trade routes as far south as Mozambique. The Romans had also been here, doubtless making use – as all the seafarers did – of monsoon winds that in season carried them south down the African coast, or east to India, and then, with the change in the wind,s northwards and homewards to the Gulf. The earliest traces of a stone town on Unguja date from the 12th century when merchant princes from Shiraz in Persia settled on the island. Over successive centuries this settlement was destroyed twice by the Portuguese (who, after Vasco Da Gama discovered he could sail round Africa in 1498, seized control of the Indian Ocean trade) and once by the Omani Arabs whom the Swahili sultans of the Kenya coast called in on several occasions to help rid them of the European tyrants. 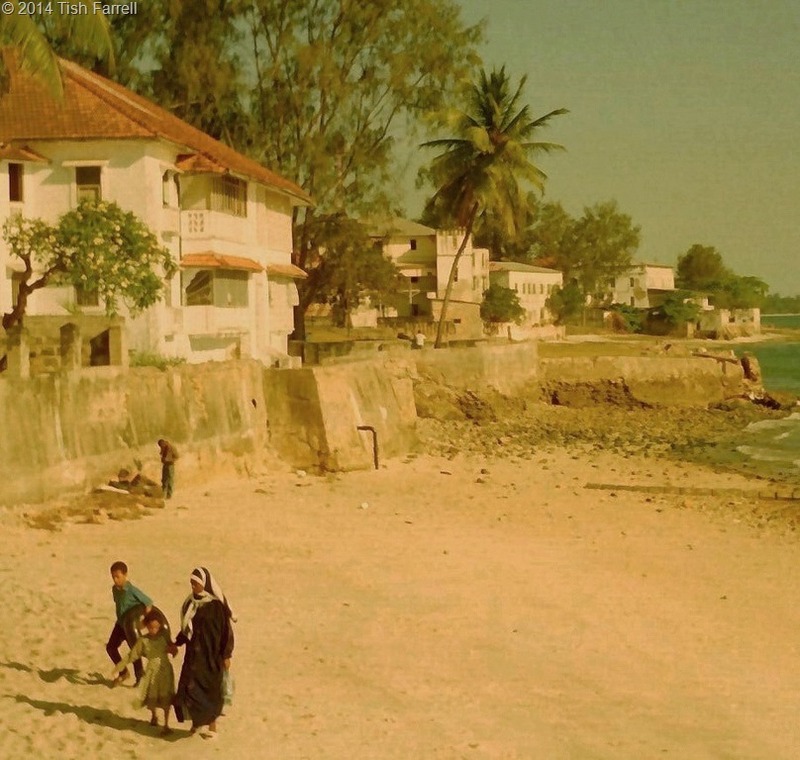 The Portuguese were ousted from Zanzibar and the Swahili mainland at the close of the 17th century, and thereafter, until the British declared Zanzibar a protectorate in 1890, it was the Omani Arabs who controlled the surviving Swahili states. 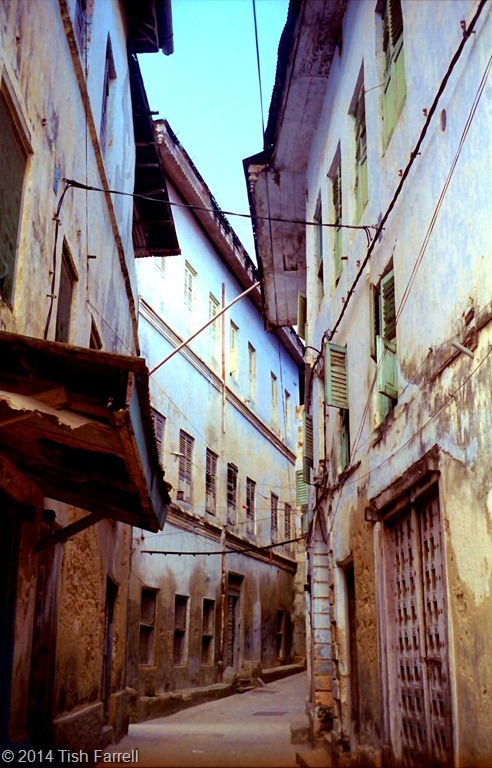 “Zanzibar was then a cosmopolitan metropolis. Its harbour teemed with square-rigged ships from the West and oriental dhows with their lateen sails from many countries in the East, carrying all the colours of the rainbow. Here Yankee merchants from New England drove a hard bargain with Hindu traders in their large crimson turbans or Khojas in their long coats, exchanging ivory for American cloth; the Marseillais haggled with the Somali for hides and sesame seeds from Benadir; Hamburg entrepreneurs shipped tons of cowrie shells to West Africa, where they served as currency; and Arab caravans rubbed shoulders with their African counterparts from the Mountains of the Moon.” (The History and Conservation of Zanzibar Stone Town 1995). Beit al-Ajaib, The House of Wonders, was built by Sultan Barghash in 1883 to host ceremonial events. 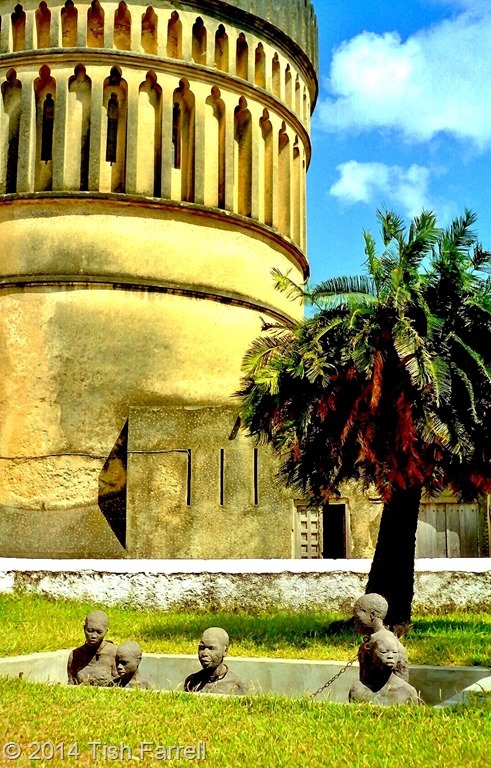 He was an extravagant man and, before his death in 1888, built 6 palaces across the island of Unguja. 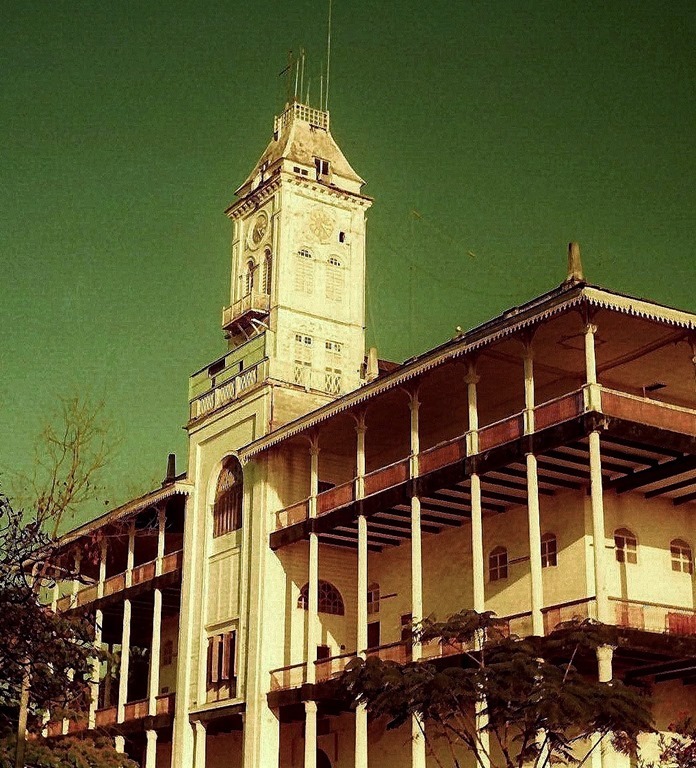 After the 1964 Zanzibar Revolution when the Omanis, along with many Indian residents, were killed or expelled, the building was used as government offices. When we visited in 1999 it was abandoned, but for one of the last sultan’s cars (candy pink in colour) parked inside the atrium near the front door. A good friend who visited the House of Wonders recently tells me it is still there. 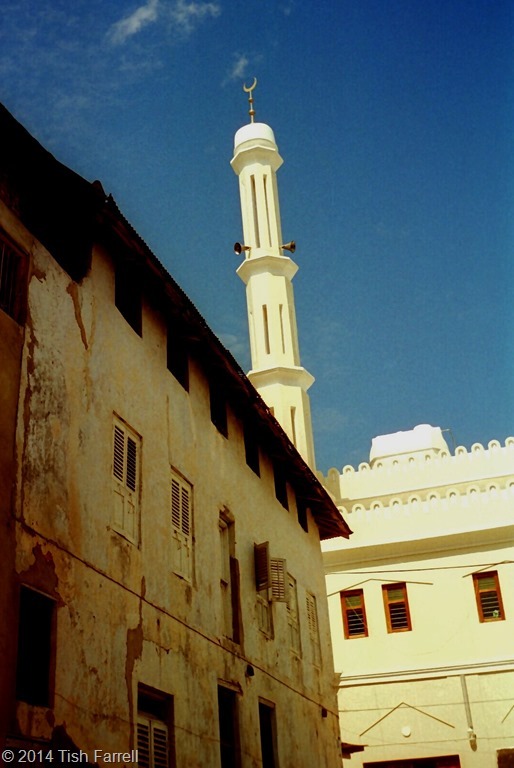 Trade was given much impetus in 1830 when the Sultans of Oman moved their capital to Zanzibar to oversee what turned out to the short-lived boom in clove production. They and other Indian and Arab landowners owned many clove and coconut plantations on the archipelago, and these were worked by African slaves. The slave trade, then, was another source of the island’s prosperity. By 1860 the archipelago had some 60,000 slaves, not only working the plantations, but also fulfilling domestic and labouring tasks, and providing new wives for the sultan’s harem. And it is worth noting here that the slaves in Zanzibar were not generally ill treated in the way they were in the Americas; it was not unknown, after long service, for them to inherit their master’s land and property. The children of the harem slaves were also acknowledged by the sultans who fathered them, and treated as royal children with appropriate titles. During the 19th century it is reckoned that some 50,000 slaves a year were being sold in the Zanzibar slave market. It was only in 1873 that the slaving was abolished, this after much pressure from the British who had first made a treaty with the Sultan Said in 1822 in an attempt to kerb the trade. That treaty had produced little effect. There was too much demand. The French, in particular, needed slaves for their tropic island plantations. 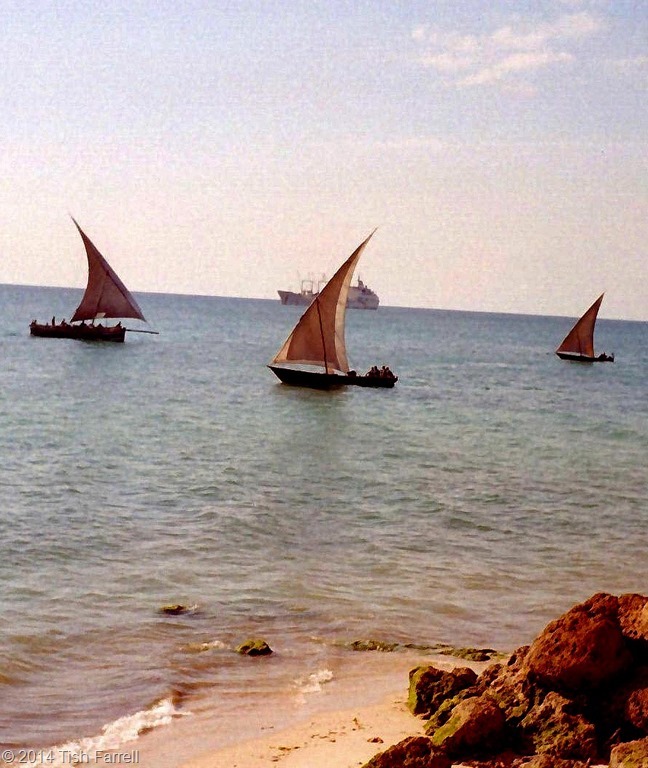 And to meet the demand the Swahili and Arab slaving expeditions would set off from Zanzibar for the African mainland, taking their caravans of porters along well-walked slave paths through Tabora in Tanzania, and down into Zambia, or travelling up present day Kenya to the Great Lakes regions. The notorious Swahili slaver, and plantation owner, Tipu Tip, roved as far as the Congo , terrorizing villages across the territory. Finding some way to end the trade was one of the motivations that drove the missionary-explorer David Livingstone ever onwards on his gruelling explorations across Africa. It was thought that if the continent was opened up to civilizing Europeans, then the ‘filthy trade’ could be stopped. But then like the slavers, he and other European explorers (Burton, Speke, Stanley, Cameron, Thomson) started their journeys from Zanzibar. All such travellers, including missionaries, relied on the expertise of porters and seasoned safari guides who otherwise worked on the slave caravans. 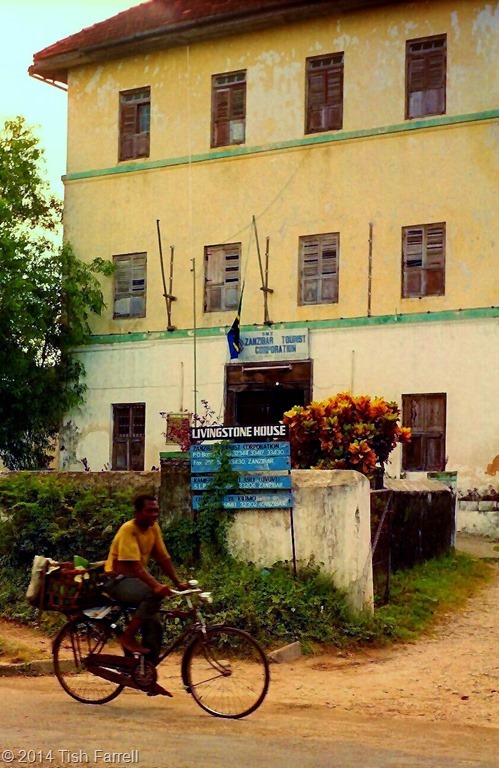 In 1866, before his last expedition, Livingstone stayed at the house above. It had not long been built by Sultan Majid. 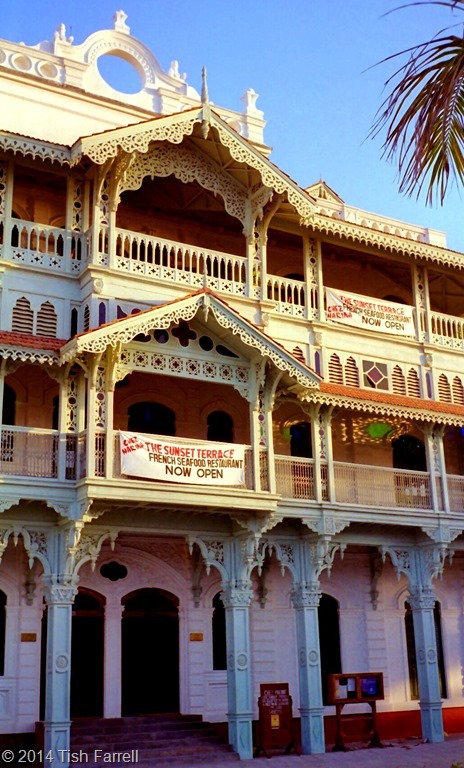 Now it is the office of the Zanzibar Tourist Corporation. The slaving and ivory trades worked in tandem. 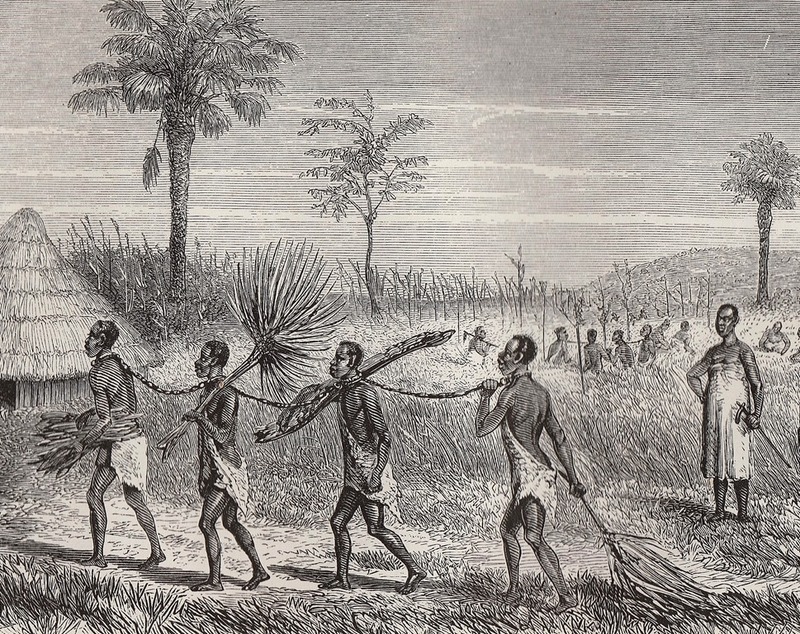 Newly captured slaves were not only driven on forced marches across the continent to the coast, but they were also made to carry supplies, and these included any elephant tusks that the slavers had procured – ivory destined for the production of piano keys and billiard balls for the European market. 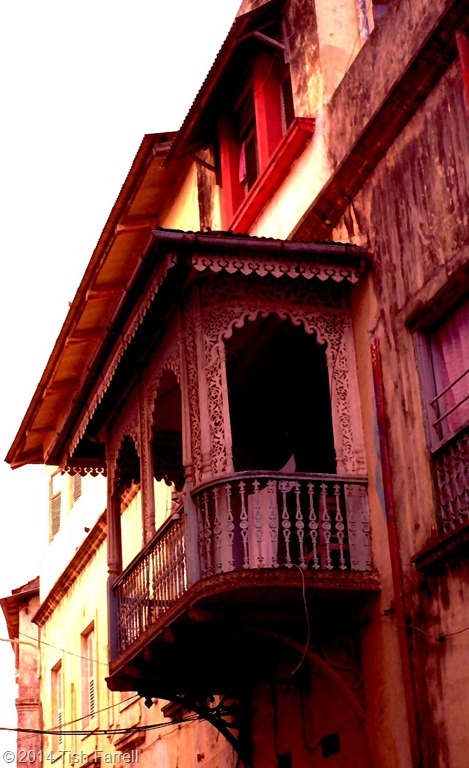 It was only in 1897 that all slaves on Zanzibar were given their freedom. The Anglican church stands on the site of the slave market, beside the now famous sculptures commemorating the years of abuse. It is horrifying to consider what the cost of this trade has been for Africa: generation upon generation of the strongest, brightest and most beautiful young people robbed from their communities. Naturally the British could congratulate themselves on finally stopping the trade on Zanzibar, although I believe it continued well into the 2oth century at Lamu. Today, too, slave mongering thrives, and under our very noses in Europe, only now the abused are not necessarily black, so perhaps we don’t think it’s the same thing – the brutal deprivation of liberty and dignity, along with forced labour? 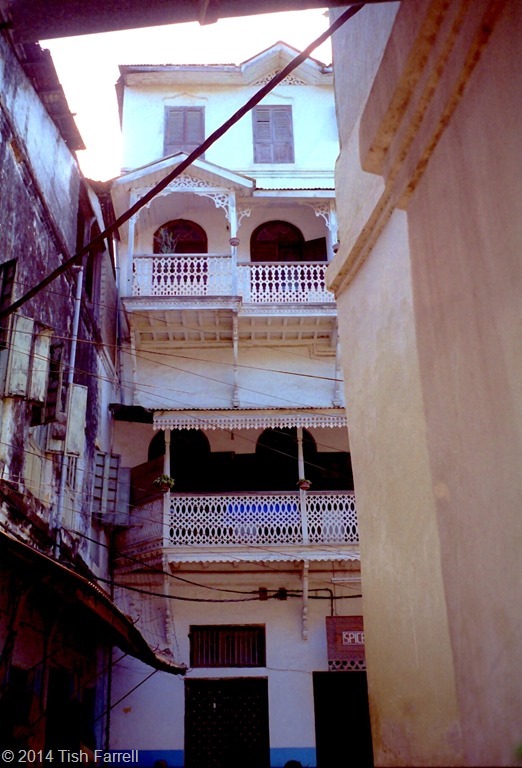 But back to 1890, the end of the Sultans’ control and Britain’s laying claim to Zanzibar. Because now we come to a whole new angle. For this was also the year of the Heligoland-Zanzibar Treaty, an agreement between the Germans and the British, whereby (in return for Heligoland, the strategic North Sea island), the Germans waived rights to Zanzibar, Witu on the mainland coast, and to the territory now known as Kenya across which the British were planning to build the Uganda Railway. (Bismarck apparently called this deal swapping the trousers for a button). For more of the colonial story go to an earlier post Vulcanicity HERE. 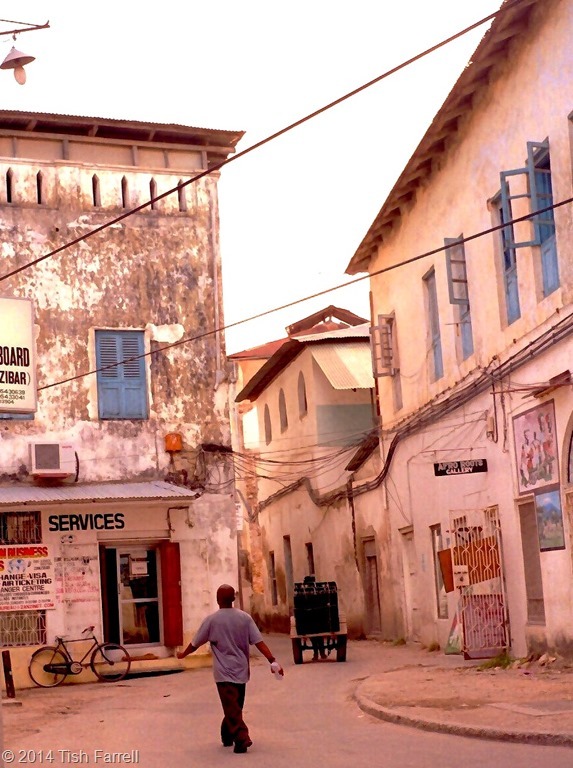 In the meantime below are some more soothing views in and around Stone Town, now a World Heritage site. 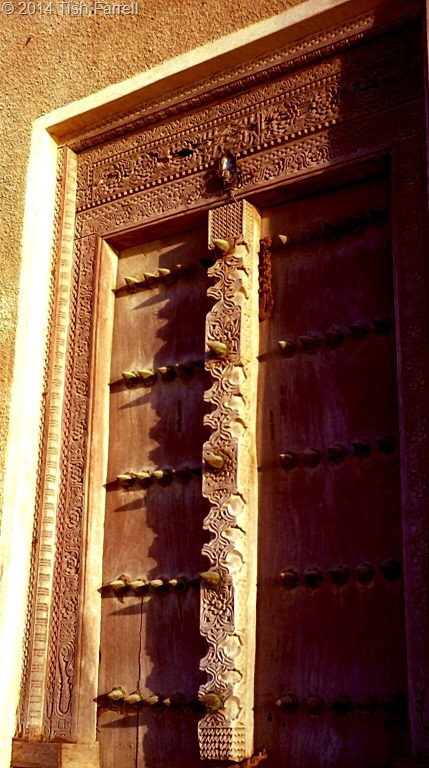 Life is not so grand as it was in the days of the finely robed Omanis. 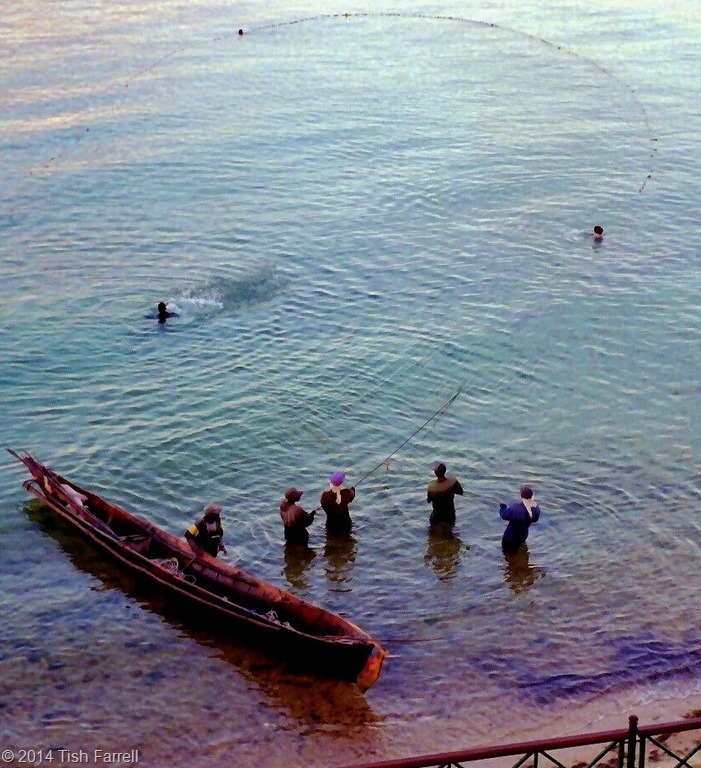 Fishing, ferrying, farming (growing spices, coconuts and vegetables), curio trading, boat building, mangrove pole harvesting and tourism are the main sources of income. As in all African countries, people work hard to educate their children, and this is their number one priority. 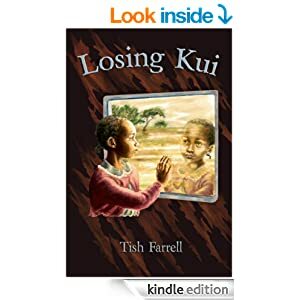 Posted on July 4, 2014 June 18, 2018 by Tish Farrell	This entry was posted in Africa, Cultural History, photography and tagged #amwriting, Abdul Sheriff, cloves, colonialism, East Africa, Heligoland-Zanzibar Treaty, Kenya, Lamu, Mombasa, Periplus of the Erythraean Sea, plantation labour, Sinbad, Slavery, spice islands, Swahili, Tanzania, Tish Farrell Writer, Unguja, wplongform, Zanj, Zanzibar. Bookmark the permalink. Just a pleasure to read. Zanzibar is such an interesting place, so thanks for teaching me a bit more about it, especially the history. The photos too were interesting. Wonderful – what a fabulous place. Your photos and words really bring it to life. I love the flow of language and words like lanteen sails carry me away to the exotic and the unknown. Fascinating to learn of those ancient trade routes – maybe that accounts for the similarity of folktales from Africa and Greece. One question – is ambergris the same as amber from the Baltic? Yes, and yes about the folk tales. 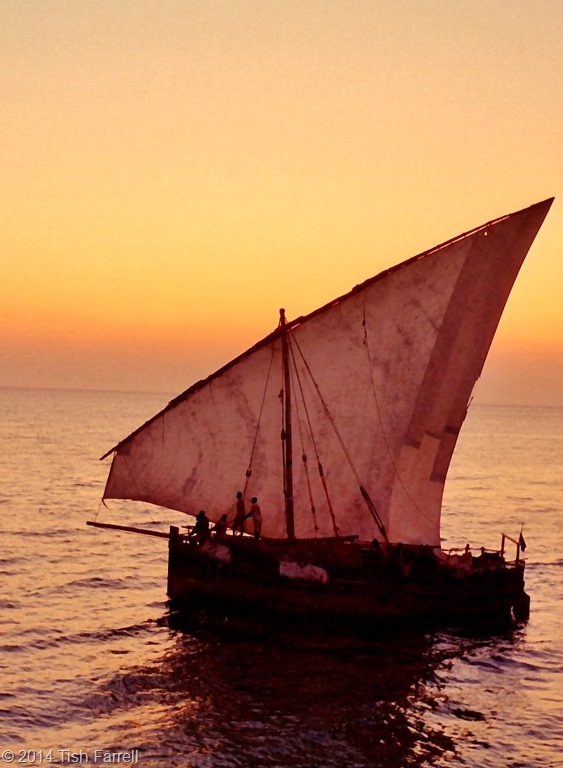 So many must have been told on board the dhows and carried from place to place. Also because the cycle of monsoon winds was hardly fast, mariners would spend much time beached in different communities, getting their craft repaired while waiting for home winds. Plenty of time for story swapping. As for ambergris it’s apparently a resinous matter excreted by sperm whales which is used in perfume making, though it sounds a little gross. Oh of course – I did know that about ambergris – it does sound gross I agree. I wonder if the name is because it smells something like amber? Such a lovely thing to say, Suzanne. I forgot to say the word ‘lateen’ does it for me too. Also many geographical terms like landfall, bluff and kopje and scarp and scree. They are descriptive, but they are also traveller’s words, ones you need to document movement across the planet. Glad you enjoyed the little tour, Su. And yes, it is a fascinating place with a huge amount to say about itself for a small archipelago. Lots more stories! A wonderful post, Tish! Awakened nice memories, but also provided much knowledge I didn’t have. History is always interesting, sometimes grim and sometimes soothing. Yes, I quite agree re the history. I get hooked on the interconnectedness of things, and looking at the consequences of events that often last far longer than we imagine. You do it with fantastic skill! Ooh, lucky you, Madhu. Where are you staying? Can recommend the Spice Tour if it’s on offer – you get to see rural Zanzibar, and probably palace ruins and Persian bathhouses too. 🙂 does The Spice tour sound interesting. We are debating between Emerson Spice and Kisiwa House. I’ve not stayed in either, but I think I’d choose the Spice Hotel. It’s been there ages (first photo of the final set of photos on this post) and very much INSIDE the narrow Stone Town streets. Graham stayed there years ago while working as a agricultural volunteer in Tabora, but it looks to have been much up-scaled since then. He told me he went and slept on the roof. Thanks Tish. Shall let you know how it goes. The slave sculpture is magnificent – a fascinating read as ever. Yes, Robin, it is a very moving piece of work. You’ve also made me realize that I need to find out who created it. A rich history there, Tish. And excellent photographs. The making of human history is mostly an unpleasant phenomenon. Yet we continue in the same vein. From my studies of the Bible, I realize humanity has always been the same. Same people different times. Or same garment different wearers. Thanks for the post. I appreciate the effort you invest to bring us such a wealth of forgotten knowledge. Have a great weekend. Thank you for reading my posts, Peter. Your comments are much appreciated. I agree with your view of human history and how we never learn. I suppose I write what I do in the hopes that enough of us will find better ways. Also, my other thought is that all the stuff that happened in the past – especially colonial exploitation, or slavery for that matter, still resonates through the current dilemmas in Kenya and elsewhere. So many matters were left unresolved at Independence, and there was no attempt to create a constitution, particularly in relation to land ownership, that fairly served the majority of citizens. The land problem is, I think, the worst colonial legacy in Kenya. It is a constant source of dispute. Jomo Kenyatta–you should hear how he’s praised–only worsened the problem when he came to power after the British. And the subsequent presidents, even his son, have been incapable of finding a solution. They protect one another, all being criminals. It is very sad, Tish. Thank you for the well written history and information, Tish! You are most welcome, Amy. Thanks for reading. What an interesting historical account of this region, Tish. I always feel enriched and more knowledgeable after reading your posts. Thank you. I love to see your smiley face, Ark. You are so kind too to promote my posts, so here’s a 🙂 back. Cheers. Yes, this is so sad. Came across this attitude among expats and also some European Kenyans in Kenya. You’d hear the latter in shops, speaking to assistants as if they were half-wits, and so aggressive with it too. And then you’d see these really decrepit faded old white people, who on dwindling pensions couldn’t afford to go back to live and be looked after in the UK, or bear the thought of the cold there, but could only survive in Kenya because they were being cared for so tenderly by their African employees. It was extraordinary to see. Wonderful post. I have been wondering if Zanzibar was worth a visit and your post tells me it is. Oh yes, Marie, definitely worth a visit. I only skimmed the surface. I was going to ask about the sculpture, Tish. Your photos are such beautiful colours. 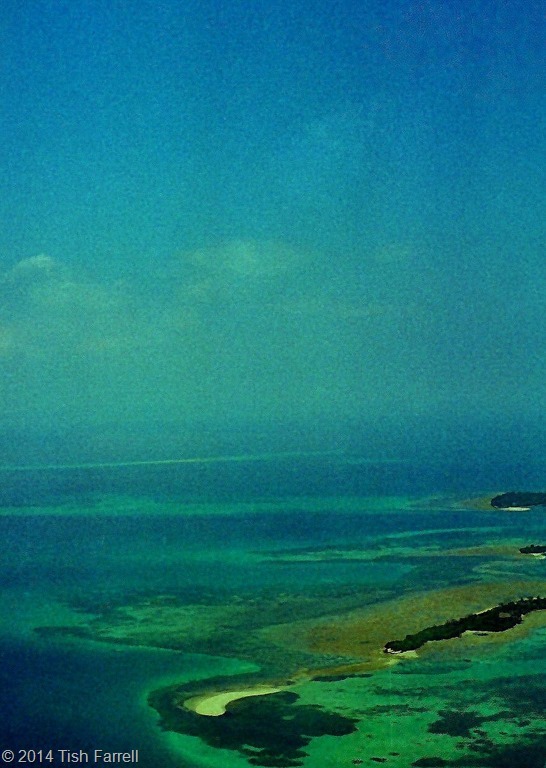 When did you visit Zanzibar? For somewhere that sounds so exotic, it’s had a very bumpy ride. Helllo, Jo. I was there in 1999 – rather a long time ago one is horrified to discover. And now you’ve reminded me. I still haven’t found out more about the sculpture. Will do some digging. It’s in Swedish but good pix of her other work, including other examples in Africa. Looking at it again, it’s a pleasure to read. I much appreciate your re-reading, Stephen. And thank you for your kind comments. I had no idea of the Swahili / Zanzibar connection, along with all the billions of other things in the universe I have no idea about. I love the thoroughness of your backgrounding, and your skill in making it read smoothly. I struggle with this in my own writing. The photos are stunning. What places you’ve been! Your appreciation is much appreciated. I was very lucky to end up spending 8 years in East Africa. It was a mind-altering experience: one I am still processing, though it is a long time now since I was there. Thank you for reading my posts with such enthusiasm. As to writing smoothly, it is only practice, and imagining that you are talking to someone directly. Was well worth a trip to the kitchen for a coffee and biscuit then to park off for ten minutes for a second or third read of this smashing post? But you are naughty! All those links. I could linger for ages, I know. But other things beckon. ”I’ll be back”, to quote Arnie. So pleased that you follow where I beckon, Ark, and not only once either. What a hero. I do reciprocate. I’ve just been up your garden path for the lemons etc. Which, btw, you still have not emailed to me. My jar of preserved ones is getting frighteningly low. And as to the links – well, it’s all about recycling, isn’t it. Like turning my compost heap, which I was doing yesterday. Even I find things there that I don’t recognise. Yikes! So that’s what it was. Beautiful. Makes me want to go there. Have wanted to for a long time. Let’s hope I find the time one day. Oh do find the time to go. Zanzibar is very special. Love the photos you shared – especially those of the boats. And that map! where did you get it? So happy to hear you enjoyed this post, Ju-Lyn. As to the map, I’m annoyed I didn’t credit it. I’m pretty sure it’s from a book or article that I own, but now cannot remember which one. Oh dear!